Nature-inspired nanostructures engraved into glass could cut window-cleaning costs in tall buildings while reducing heating bills and increasing worker productivity. The “smart window” was developed through a research project at the University College of London with support from Engineering and Physical Sciences Research Council. The team discovered that combining nanostructures with a thermochromic coating amplifies the thermochromics properties of the coating. The result is a self-cleaning, highly performing smart window, said UCL researcher Dr. Ioannis Papakonstantinou in an EPSRC statement. The new “smart window” comines nanostructures with a thermochromic coating to ampliy the thermochromics properties of the coating. According to the researchers, the UCL team calculated that the new windows could result in a reduction in heating bills of up to 40 percent, with the amount depending on the exact latitude of the building where they are used. A suggested use of the windows—which are in prototype state—is high-rise office buildings. “It’s currently estimated that, because of the obvious difficulties involved, the cost of cleaning a skyscraper’s windows in its first 5 years is the same as the original cost of installing them,” said Papakonstantinou. “Our glass could drastically cut this expenditure, quite apart from the appeal of lower energy bills and improved occupant productivity thanks to less glare. “As the trend in architecture continues towards the inclusion of more glass, it’s vital that windows are as low-maintenance as possible,” continued Papakonstantinou. Self-cleaning: The window is resistant to water, so rain hitting the outside forms spherical droplets that roll easily over the surface—picking up dirt, dust and other contaminants and carrying them away. 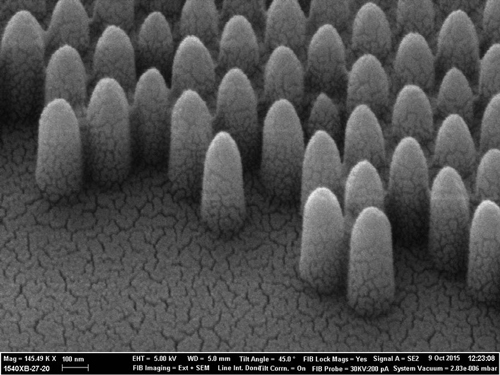 This is due to the pencil-like, conical design of nanostructures engraved onto the glass, trapping air and ensuring only a tiny amount of water comes into contact with the surface, the researchers said. On standard glass, raindrops cling to the surface, slide down more slowly and leave marks behind. Energy-saving: The glass is coated with a thin (5-10nm) film of vanadium dioxide that during cold periods stops thermal radiation from escaping and prevents heat loss. During hot periods, it prevents infrared radiation from the sun entering the building, researchers said. Vanadium dioxide is a cheap and abundant material, combining with the thinness of the coating to offer real cost and sustainability advantages over silver/gold-based and other coatings used by current energy-saving windows. Anti-glare: The design of the nanostructures also gives the windows the same anti-reflective properties found in the eyes of moths and other creatures that have evolved to hide from predators. It cuts the amount of light reflected internally in a room to less than 5 percent—compared with the 20 percent to 30 percent achieved by other prototype vanadium dioxide coated, energy-saving windows. This reduction in glare provides a boost to occupant comfort. Smart windows could begin to reach the market within around three to five years, depending on the team’s success in securing industrial interest. Researchers are now discussing commercializing the new windows with UK window manufacturers. 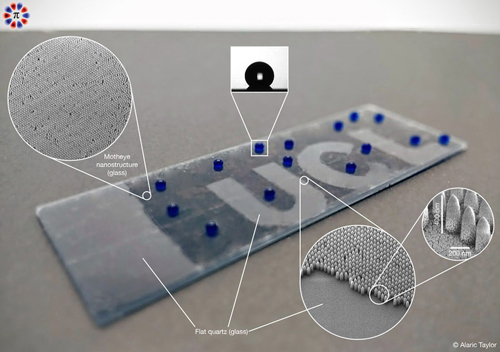 The key is to develop ways of scaling up the nano-manufacturing methods that the UCL team have developed to produce the glass, as well as scaling up the vanadium dioxide coating process. Smart windows could begin to reach the market within around three to five years, depending on the team’s success in securing industrial interest. “We also hope to develop a ‘smart’ film that incorporates our nanostructures and can easily be added to conventional domestic, office, factory and other windows on a DIY basis to deliver the triple benefit of lower energy use, less light reflection and self-cleaning, without significantly affecting aesthetics,” said Papakonstantinou. The in addition to Papakonstantinou, the UCL team includes Alaric Taylor, a Ph.D. student in Papakonstantinou’s group; and Ivan Parkin, from UCL’s Department of Chemistry. A five-year European Research Council starting grant has been awarded to fabricate smart windows on a large scale and test them under realistic, outdoor environmental conditions. Tiny nano size dust particle could lodge into the profile and lower the clarity over a time period. Long term testing of this glass in the actual environment will help to determine it.